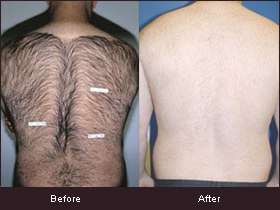 Intense Pulse Light hair removal is a fast and effective treatment with the latest technology equipment, in the hands of high trained and experienced clinicians. All areas of the face and body are treated. Sensitive areas such as bikinis, chest and back hair removal are now quick and relatively pain free. The area to be treated is shaved clean. The head (appropriate for the size of area being treated) is passed over the area. Permanent hair follicle destruction is only possible if enough heat (thermal) energy can be delivered to the hair bulb and for long enough (wide pulse width of the light flash). It also requires enough melanin concentrated in the hair bulb to allow it to absorb this heat energy. This is the reason the area is pre-shaved – so that the heat is delivered only to the hair bulb and does not burn the skin. Combined effectiveness of destroying the deep melanin pigment in the base of the hair follicles and the feeder blood vessels, makes IPL superior for permanent hair reduction. A photo-waxing result can be obtained with any machine by heat simply burning the hair in the hair shaft. This is temporary, as the hair grows back if the hair follicle, situated in the base of the deeply lying hair bulb, is not fully destroyed. It is also important to note that multiple treatments with equipment that is not effective, (pulses which do not generate enough heat or maintain heat for long enough) will damage the hair sufficiently to remove the pigment but not stop the growth. The result will be thick hair, lighter in color which will then be very difficult to treat. In these circumstances, less advanced equipment at lower treatment prices is not always a bargain, as the hair will not be removed and treatment will have to begin again. Less than waxing. Effective cooling ensures that the maximum destructive power gets only to the deeper layers under the skin. This is where the melanin and blood vessels need to be destroyed in the base of the hair follicles. Better surface cooling means the least pain and discomfort of all the IPL machines and far superior to Laser, especially for sensitive areas. No downtime with this treatment. You will see results with your first treatment. The 30% of hair in the growth stage that is treated at your first appointment will be destroyed, in the main, and not grow back at all. 4 – 6 treatments are likely, but our clinician will be specific at your consultation as your skin and hair type will determine the final treatment plan. Treatments commence at four weekly intervals, for the first 4 treatments, for maximum benefit. A fifth and sixth treatment is usually added at one to three monthly intervals, depending on whether there is further hair growth. The equipment that we use is technologically superior and provides a very fast and comfortable result. This treatment works because the intense light which is absorbed by the pigment in the follicles is converted into heat. This heat loosens the hair and disables the cells responsible for new hair growth. This affects the 30% of hair in the anagen or growing stage. Most of the hair destroyed will not grow back at all. The remainder may be lighter and thinner when it does grow back. Superior for long term and greater destruction of hair follicles due to the increased power, the longer “pulse-width” of the light beam, and the greater cooling of the surface of the skin. Very safe – the latest technology equipment in the hands of an experienced operator is very safe and the outcomes are very good. All skin types and hair colors can be treated, but the “lighter the skin color” and the “darker the hair color” (with more melanin), the more permanent hair follicle destruction is possible. Shave or use a cream depilatory (do dot wax) the area to be treated. Cold surface cooling and the long pulse-width give much greater protection against skin burns, sometimes seen with other IPL machines and often with Lasers.